A collection of over 4,003 free downloadable public domain images for crafters and web designers that have been rescued from old books, magazines, and other print materials. All of the images in this collection are copyright free in the United States and any country that extends copyrights up to 70 years after the death of the original artist making them in the public domain and free to use in your next scrapbook page, notecard or other craft projects. 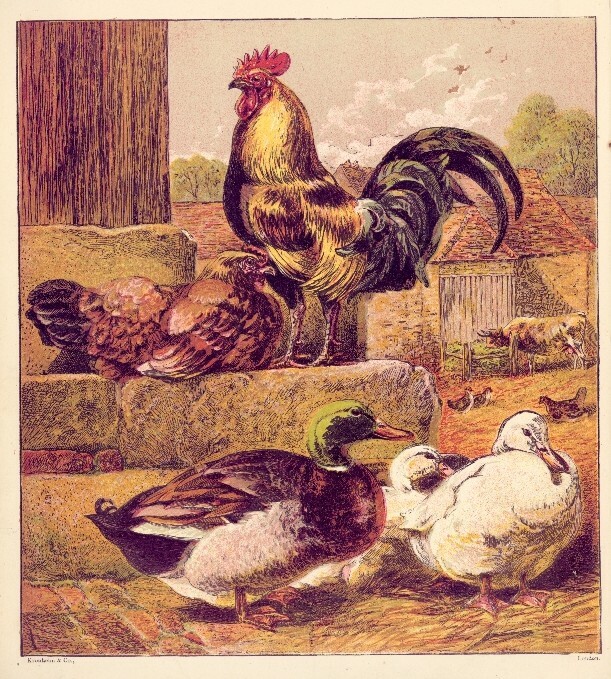 This great barnyard image features a proud rooster standing watch over his hen and all the other animals of the farm. In a rare, early colorized drawing with this level of quality from a children’s book, this image is pretty and large enough to make a great notecard cover. This circa 1865 illustration is sadly not attributed to any artist. Aunt Louisa’s Birthday Gift, written by Laura Valentine (d.1899) and published by Scribner, Welford and Co.; included many animal images that I have shared with you on Reusable Art. This image is copyright free and in the public domain anywhere that extends copyrights 70 years after death or at least 120 years after publication when the original illustrator is unknown. The images presented on Reusable Art are in the public domain as per the Berne Convention Standards. Each was selected by a crafter for use by other crafters and organized in a method that makes sense to me. Please visit our About Us page for information on copyrights and image use.